It’s a rainy evening in late February as men and women enter the British Columbia Federation of Labour building, set on Joyce Street among aging storefronts in a south Vancouver neighbourhood. Heading to a classroom, the group passes a series of framed images lining the hallway, including a photograph of a funeral procession in 1918. Union organizer Ginger Goodwin had been hunted down and shot, and the mourners, captured forever in black and white, would go on to organize a general strike. A poster glimpsed from an open office door has a more contemporary message: “Kill a worker, go to jail.” It’s the office of Gord Lechner, director of the federation’s health and safety centre. Tonight, these people are attending, free of charge, one of the centre’s unique offerings: an English as a Second Language course on health and safety. The participants sit together at tables assembled in horseshoe formation and share information about a recent job fair. Lisa Rainbird, the instructor, appears just before 6 p.m. and starts handing out copies of a news article about a study on the lack of regular hand washing among staff in B.C. hospitals. Students are still arriving, filling 17 seats, as Rainbird reads the article aloud. “I remember one doctor who wore the same gloves to do operations all day,” responds Awat Hosseini, who was a surgery nurse in Iran. She has been in Canada for four months and has just been hired as a part-time home care worker. 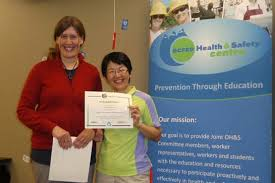 The ESL students learn that hygiene practices have improved in B.C. since the study came out, resulting in more hand washing among staff and the placement of hand sanitizers in hospital corridors. “Not having English is a barrier,” says Tadd Zhu, also from China, who works in a casino. Along with his wife, Fiona, a homemaker, they appreciate the language skills they continue to gain in the course. “This course also helps us learn about the dangers at work, and the rights of working people.” “It’s a very practical course,” agrees Ikuko Nishino, “because the health and safety issues can be used in many circumstances.” Nishino washes dishes in a restaurant, having emigrated from Japan four months ago. WorkSafe BC, an employer-funded insurance group formerly known as the Workers’ Compensation Board, provides grant money to the federation to run the course, covering the instructor’s salary. For its part, the federation provides the classroom space and hosts graduation dinners. The federation also advertises the course, although “word of mouth” accounts for at least half of the students who enrol. Long before teaching these twice-weekly classes, Rainbird worked at Immigrant Services Society of BC, a non-profit organization that serves the settlement, training and integration needs of newcomers to Canada. She says she noticed a lack of effective ESL materials on work safety, “and there was a need to teach this because of injuries on the job.” So, Rainbird enrolled in the occupational health and safety program at the British Columbia Institute of Technology (BCIT), and graduated two years later. There, she gained extensive knowledge about the major categories of workplace hazards, which include chemical, physical, biological, ergonomic and psycho-social hazards. Rainbird started her own consulting firm and, soon after, met Sheila Moir, who was then occupational health and safety director for the federation. Moir was also interested in developing programs to reach new Canadians, and the result was this 14-week course, designed and taught by Rainbird. Students have followed up by taking more work and safety courses at BCIT, Rainbird says. “Most important, they know they can telephone WorkSafe BC confidentially if there is an issue, and a staff member will come out and inspect their workplace.” The inspector will write an order if he or she agrees there is a violation, and the company is legally required to take action or be subject to a fine. The program has several guest speakers, including a federation staff member, who talks to students about basic employment standards. “Some participants have become more active in their unions because of this course,” Rainbird says. “Unions play a huge role with workers’ rights, and health and safety is an extension of that.” She hopes to eventually develop an online ESL health and safety curriculum in order to reach more people. In Canada, on average 1,050 workers are killed every year because of their work and 150 of these people are from B.C. The provincial laws give workers some protection, such as compulsory health and safety orientation for young and new workers, and the right to refuse unsafe work. The National Day of Mourning, held every April 28, recognizes people who have died, been injured, or suffer illness because of their work. This annual remembrance, with its powerful message, was initiated by Canadians 26 years ago and, since then, has spread around the world. Gord Lechner says many barriers continue to prevent workers from gaining the information they need to be safe. “We can get to workers,” he says of the federation’s ESL course, “and they trust us.” Besides reaching out to new Canadians, Lechner says seasonal workers, such as farm workers, are also offered courses where translators are provided. “Alive After Five,” another key program, uses a peer training approach and real-life case studies to help young workers learn about their rights under the Workers Compensation Act and occupational health and safety regulations, and how to exercise those rights on the job. The labour federation is expanding this unique curriculum by partnering with Decoda Literacy Solutions to run similar courses in communities across the province. More barriers will be removed, Lechner says, because instructors will also reach out to workers lacking literacy skills or dealing with learning challenges — as well as those who want to improve their English-language skills. “This program is going to help far more people,” he says. Rainbird’s final lesson of the night is on fire safety, “the third leading cause of death in the workplace,” she tells the class. Students follow along with a handout that has lots of graphics. They learn the different ways fires start. Holding up a fire extinguisher, Rainbird explains what’s inside the tube, how to operate it, and the need for annual maintenance. “Has anyone used a fire extinguisher?” she asks. Franco Kai Kwong Chan, a dietary aide in a hospital, puts up her hand and says she had training at a medical laboratory in Hong Kong. Rainbird provides an easy way for students to operate the canister by telling them to remember the four letters in the word PASS: “P” is for “pull” the pin, “A” is for “aim” at the base of the fire, “S” is for “squeeze” the lever, and the second “S” is for make a “sweeping” motion as the foam is released. “Imagine a fire has broken out,” Rainbird says. “Am I in a good position now?” she asks, as she moves away from the door. “No,” comes a chorus of replies. “That’s right,” Rainbird says. “You want to back in to the escape route, not become trapped.